No one plans to be groggy on the job. And it’s not always caused by simply staying up too late. Sleep apnea a severe health risk affects more than 12 million Americans according to the American Lung Association. Sleep apnea is a common condition that can lead to other health issues and injuries on the job and behind the wheel. Some sufferers could be running machines in factories getting sleepy behind the wheel or having other health issues because of the condition. Dana Reihman MD pulmonary and sleep medicine specialist said the condition can vary in severity. If left untreated it can also lead to other serious health problems. 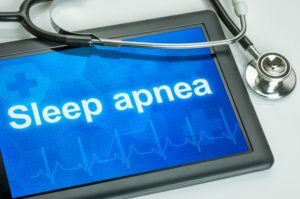 “With obstructive sleep apnea you wake up so much at night that you don’t get into a deep sleep and therefore tend to be tired during the day” he said. The condition is more common in overweight men but can affect people of all genders and weight. With the obstructive condition the tongue blocks the airway and causes the person to stop breathing while asleep. When it happens the person actually starts to smother. This generates an adrenaline reaction that jolts the person awake. This happens over and over leading to a lack of rest and challenges in staying awake during the day. Dr. Reihman who is medical director of the Reid Health Sleep Center said the adrenalin reaction over time also creates other imbalances including blood glucose and can affect the cardiovascular system as well. The condition reduces productivity and increases the risk of injury both to workers and others especially for truck drivers. “This tends to be a disease of truck drivers” Dr. Reihman said. In fact he said anyone applying for a CDL license with a collar size greater than 17 inches is required to prove they do not have the condition by having a sleep evaluation. The best way to assess and diagnose it is a sleep study. The Reid Health Sleep Center can perform up to 24 studies a week in its Chester Boulevard facility. A study involves sleeping the night in a comfortable home-like environment while being monitored with sensors and with a sleep technician on hand. A less detailed home test is also available. The most common treatment for someone with the condition is Continuous Positive Airway Pressure – commonly called C-PAP – therapy. This involves wearing a mask connected to a small machine that keeps the airway open with air pressure. Diagnosing and successfully treating sleep apnea can be life-changing for someone who suffers from the exhausting condition. And it can be life-saving for someone who works with machinery or even gets behind the wheel on a regular basis. For more information about Reid Health Sleep Center: (765) 983-7966. For more information about certified CDL exams: (765) 983-3149. The article states that sleep apnea is dangerous due to its effect it has on sleep patterns during the night. It says that sleep apnea can be especially dangerous if you have a job that requires the operation of heavy machinery since the lack of sleep can make you less aware. I think if I suffered from obstructive sleep apnea I would want it treated right away so as to avoid any serious health problems that come as a result of not getting the sleep I need.